Since the publication of Stitches a decade ago, David Small has emerged as one of the seminal authors in the genre of graphic literature. Here, in Home After Dark, a Boston Globe Best Book of 2018, Small provides a "painfully honest" and "haunting work of unfolding surprise" (Jules Feiffer) that renders the brutality of adolescence in the 1950s. Through "gorgeous and expressive drawings" (Roz Chast), Small "recaptures the inchoate chaos of youth" (Jack Gantos), telling the story of thirteen- year- old Russell Pruitt, who, abandoned by his mother, follows his father to the sun- splashed land of California in search of a dream. Suddenly forced to fend for himself, Russell struggles to survive in Marshfield, a dilapidated town haunted by a sadistic animal killer and a ring of malicious boys. 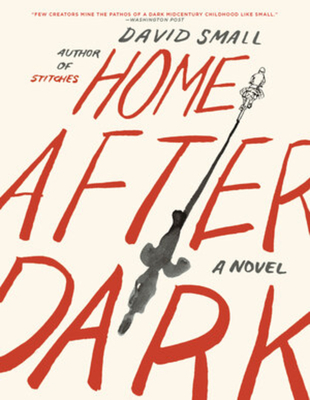 Eerily foreboding yet filled with uncanny psychological insights and stray glimmers of hope, Home After Dark confirms Small's place as a modern master of graphic fiction.